Choosing a podcast host is tough. You know you want to use WordPress somehow, but other than that, there are a ton of options to choose from. One of the options that may get thrown your way is Buzzsprout. Touting their ease-of-use, simple billing, and a focus on the people behind the mic, Buzzsprout has put the same impetus on their WordPress plugin so that podcasters of all levels can be successful. There are a handful of things you need to pay attention to regarding podcast hosts. Storage capacity is the main one. Allotted bandwidth comes in a close second. And how both of those metrics are tracked rounding out the trio. Way off in the distance may be how well the host interacts with your distribution platforms. With Buzzsprout, you’re not getting anything that Libsyn or Blubrry don’t offer, really, but it’s in a much easier to manage package. And that’s the draw. They have a strong WordPress plugin. They have a straightforward interface, and they give you understandable documentation. With all that, getting set up to podcast with Buzzsprout and WordPress is a cinch. Like everything else, you’re going to have to sign up for an account. They do have a free tier that you can sign up for, which is great for people who aren’t sure if podcasting is for them yet. You get 2 hours of audio a month. That month’s audio is stored on their servers for 90 days after upload. While that’s not going to work for any serious podcaster, it’s just fine for someone who wants to test the waters and get their feet wet with the medium. Or to see if Buzzsprout is the way you wanna tie your cast to WP. Once you’re validated and signed in, you get a choice. Are you new, or do you have an existing show? In the end, they’ll take you to the same place. 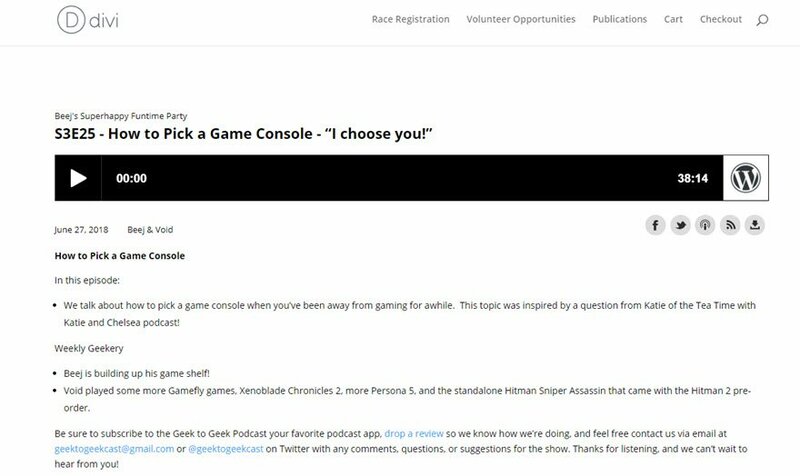 However, if you have a show already and want to see what Buzzsprout can offer from the get-go, they can import a couple of episodes from your existing feed so you can hit the ground running. I chose the second option for this. However, the only difference in where you end up is either a blank dashboard or one populated with your media already. The best part about Buzzsprout is the dashboard. It has the cleanest interface of a podcast host that I’ve ever used. Simply put, it works. It’s no frills, simple, and functional. That’s rare. We did a whole article on setting up your podcast for iTunes. So I won’t rehash that here. But you should know that Buzzsprout has fantastic documentation for that process. And for all the other major platforms you’ll want your show to be on. Follow their instructions for filling out your podcast info under the iTunes & Directories tab, and you’re essentially done with your back-end setup. For WordPress integration, you’ll want to install the Buzzsprout plugin. It’s in the WP.org repository and free, so get it installed and activated. You know the drill. You will now have a new menu item at Settings – Buzzsprout Podcasting that looks like this. The plugin works by pulling your RSS feed, so enter it here. 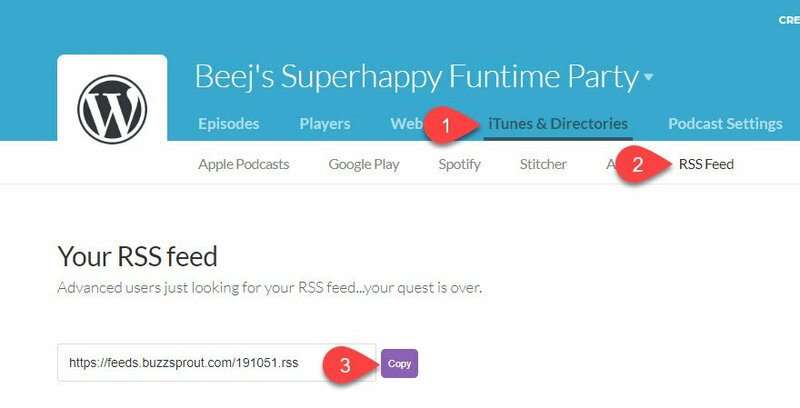 You find the RSS feed address in the Buzzsprout dashboard under the iTunes & Directories tab. Clicking on any episode will give you a shortcode you can place anywhere, but it will generally be in the body of a blog post. 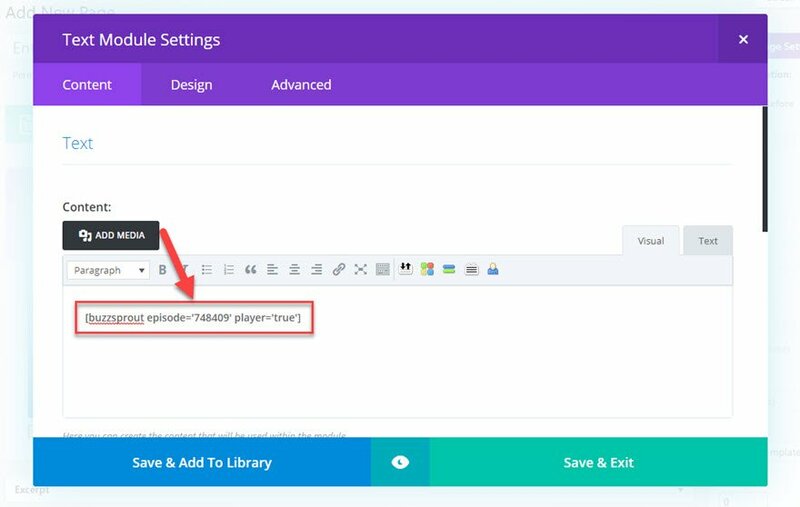 That shortcode renders every single thing you’ve uploaded in your Buzzsprout settings into that spot: the player (when marked true), the show notes, social links, etc. Keep in mind, though: this does not publish your podcast itself. That’s done in the Buzzsprout dashboard when you hit save. This is just an import from your RSS feed. Unlike services like Seriously Simply Podcasting or Blubrry PowerPress, Buzzsprout’s plugin does not push the episode live. You do all that on the Buzzsprout site. Additionally, the black and white player above is the default for Buzzsprout. You can go into your settings and change that. Just go to the Players tab and click the Customize Your Players button. Inside, you can change every last detail about the player. Style (new or classic), details like podcast title, date, author, the color scheme, artwork (custom, show, or episode), and which sharing buttons you want, as well as whether you want to let folks download the media on their own. No matter what you choose, the styling will show up anywhere that player is used. That means the WordPress plugin gets updated, including episodes that you’ve already embedded into your site. You don’t have to go back refresh anything at all. Your hard work is safe. I think that Buzzsprout has the best migration system of any host (at least in terms of DIY systems). Being able to just download and import your existing show’s media via RSS is brilliant. I think other hosts need to do the exact same thing. Because once that’s done, you just change the feed address you submit. That’s awesome. Additionally, if you decide to stick with them, if you pay for a plan (even the smallest one), they let you import all your back episodes for free, and it doesn’t count against your monthly quota. So if you’ve got years and years of episodes that add up to hundreds and thousands of hours, you don’t have to worry about paying for overages. As someone who’s personally been scared to move away from Libsyn because of the headache migration can be, seeing this option was worth mentioning here, too. 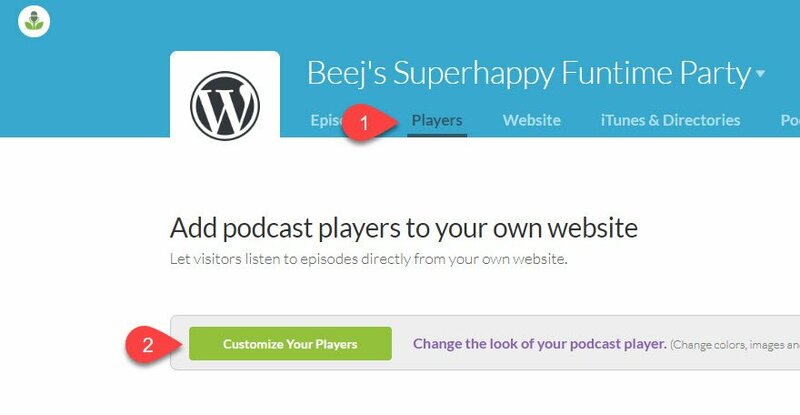 Additionally, it’s worth looking into if you’re using something like SquareSpace to host your podcast and want to move to WordPress. Because moving away from there can be a pain, and Buzzsprout’s show migration method fixes a lot of that headache. 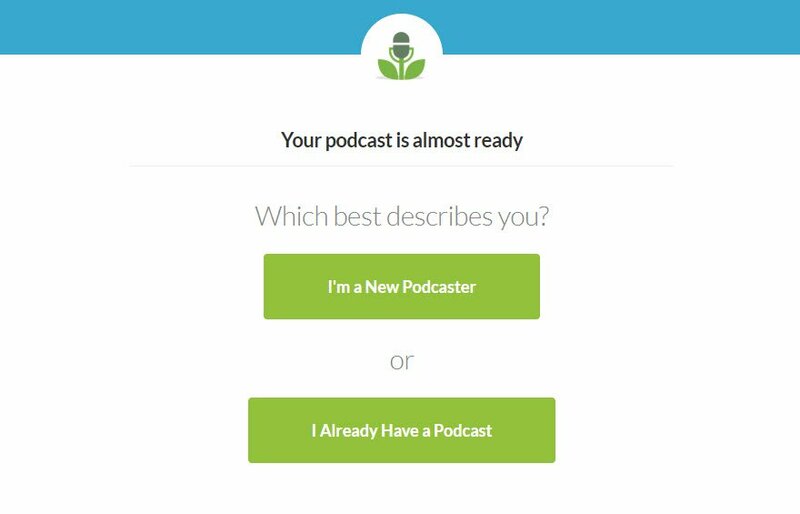 Have you tried Buzzsprout for podcasting yet? What would make you give it a shot, if not? The post How to Podcast with Buzzsprout and WordPress appeared first on Elegant Themes Blog.